Peter Parker returned home in 2000 after 4 years abroad both interstate and internationally. He grew up in the Eaglemont area helping his father in the Eaglemont Newsagency doing paper-rounds for 15 years. After finishing at Ivanhoe Grammar he enrolled to become an Osteopath in the 5-year full time double degree course at RMIT University. In 1995 after graduation he accepted a position for 3 years in private practice in Noosa on the Sunshine Coast in Queensland where he worked in a family orientated practice, coupled with the care of Australian elite triathletes. In 1998 Peter embarked on his biggest adventure setting up practice in Dublin, Ireland. There he worked for 2 years in which there were many highlights. This is a charity based osteopathic centre where in any one-year over 25,000 children are treated. Peter Parker formed one of many volunteer osteopaths who would work approximately every 2 weeks on children of every age. Even with the most challenging of conditions a short course of treatment often lead to a greatly improved quality of life for both the patient and the tireless parents. The OCC is the first full-time independent subsidised osteopathic clinic devoted entirely to children, to raise public awareness that osteopathy is for children too. In July of 1999 Peter Parker ventured to Romania’s largest orphanage to encounter the most inhumane of conditions for the 550 inhabitants. The purpose of the journey was to work under the umbrella of the Romanian Challenge Appeal as an osteopath to treat many of the profoundly affected babies and children. It was the most horrific and at the same time the most inspiring time of his life. Peter Parker finished off the millennium by working with the medical team for the victorious Australian Rugby Wallabies through the World Cup in 1999 held in the United Kingdom. It was a magnificent experience to work with such a professional group of people and watch as they achieved a once in a lifetime dream. He then went on to serve as the team Osteopath touring in 2000 and 2001 as the Wallabies had their most successful era ever. 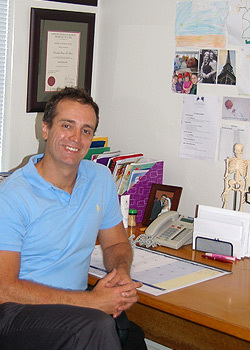 Peter Parker has always been heavily involved in the progression of his profession through the peak representative body for osteopaths in Australia “Osteopathy Australia”. Peter was Victorian President in 2001/2002, Federal President 2005/2006, and Past President in 2007. Peter currently serves on the AOA committee with Guild insurance to legally advise the profession on any Insurance claims that occur. He is committed to seeing Osteopaths gain the best reputation and practising rights within Australia, to make Osteopathy the number one choice in Allied Health Care for Australians. Heidelberg Osteopathic Clinic (HOC) was set up by Peter Parker in 2000 to offer osteopathic care to the family as a whole in a caring and relaxed environment. It has gown into one of the major complimentary health providers in Northern Melbourne. Please feel free to call Peter to assess whether Osteopathy may be able to benefit you, your family or a friend. With the opening of a new clinic in Blackburn in mid-2013, HOC was rebranded as The Osteopaths of Heidelberg and Blackburn. Peter is very pleased to be a part of the team at The Osteopaths of Blackburn and The Osteopaths of Heidelberg, offering Osteopathic care to the whole family in a relaxing and caring environment. Please feel free to contact Peter to discuss whether Osteopathy may be beneficial to you, your family or friends.